Public On Sale Begins June 25th! Corpus Christi, TX. (Jun. 19, 2018) - Whether it’s the church around the corner or a church on the other side of the globe, we all connect to God in different ways. "Big Church Night Out" is a celebration of the beauty and diversity of the many different ways we worship while uniting behind the one thing that unites us all. It’s a night of worship, entertainment, music, prayer, laughter, art, reflection, and so much more. Whether coming alone, loading up the entire family or a bringing a church group, this night is designed for EVERYONE. Featuring a different line-up each year, this model tour began in 2017 with headliners Newsboys. This second annual tour takes church on the road with a variety of great names in Christian music. 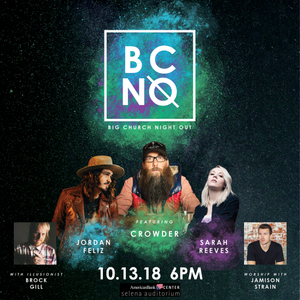 The 2018 lineup includes Crowder, Jordan Feliz and Sarah Reeves, illusionist Brock Gill and worship leader Jamison Strain. Tickets go on sale Monday, June 25 at 10:00am. Get your tickets at ticketmaster.com, the American Bank Center box office, or by phone at 1-800 -745-3000. The "Big Church Night Out" Tour will also be hosting illusionist Brock Gill, who shows the gospel in ways that you will remember for a lifetime. An evangelist at heart, Gill has shared the gospel message by means of illusions, great escapes and slights of hand to thousands of people worldwide - from youth groups and churches to massive arenas and tours, including Winter Jam. For all the tour dates, ticket prices and details, go to www.premierproductions.comor www.bigchurchnightout.com.